Topley Provincial Park lies next to Babine Lake, 12 kilometres east of Granisle, immediately west of the community of Topley Landing and 40 kilometres north of Topley. This small 12 hectare provincial park is within the asserted traditional territory of the Nat’oot’en Nation who have used this site for a food fishery. 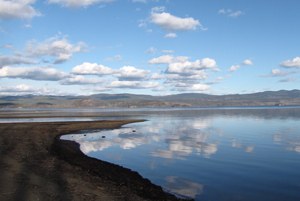 A large natural beach dominates the park’s frontage on Babine Lake. The park is close to the Fulton River sockeye salmon spawning channel. This park was established for the protection of cultural and environmental values. Recreational use is not encouraged. This park is in a wilderness area adjacent to the Fulton River spawning channels. Bears frequent this area. Visitors must be familiar with bear safety. Visitors reach Topley Provincial Park by travelling 40 kilometres north of Topley, from Highway 16 to Topley Landing on Babine Lake. 900 m south of the Fulton Spawning Channels on the Granisle Road, turn east onto Marina Way. Follow this for approximately 900 m, then turn left onto the gravel road into Topley Landing Park. History: The provincial government established Topley Provincial Park by Order in Council #1034/1964 under the Park Act in April 1964. Culture: The park lies on a traditional Nat’oot’en Nation fishery removal and transport site. Conservation: The park encompasses an extremely small area of the under-represented Babine Upland Ecosection. Currently only 4% of the Babine Upland Ecosection is included in the protected areas system. Topley Provincial Park is one of 19 protected areas in this ecosection, contributing less than 1% of the overall protected area representation of this ecosection. The park contributes minimally (less than 1%) to the overall protected areas system representation of SBSmc2 (Sub-boreal Spruce, moist cold subzone, Babine variant). The park encompasses a remnant riparian ecosystem and has high fish habitat values. Approved Management Direction Statement [PDF] for Topley Landing Provincial Park is available online.